This article is about the museum in New York City. For the museum in Washington, D.C., see National Museum of Natural History. Not to be confused with the National Museum of American History. 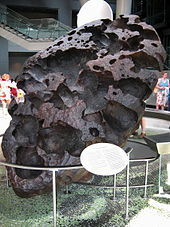 The American Museum of Natural History (abbreviated as AMNH), located on the Upper West Side of Manhattan, New York City, is one of the largest natural history museums in the world. Located in Theodore Roosevelt Park across the street from Central Park, the museum complex comprises 28 interconnected buildings housing 45 permanent exhibition halls, in addition to a planetarium and a library. 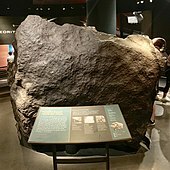 The museum collections contain over 33 million specimens of plants, animals, fossils, minerals, rocks, meteorites, human remains, and human cultural artifacts, of which only a small fraction can be displayed at any given time, and occupies more than 2 million square feet (0.19×10^6 m2). The museum has a full-time scientific staff of 225, sponsors over 120 special field expeditions each year, and averages about five million visits annually. ^ a b Collins, Glenn (1991-12-01). "Clearing a New Path for T. Rex and Company". The New York Times. Retrieved 2018-05-05. ^ Barron, James (2010-06-20). "Teddy Is Restored. In Paint, at Least". City Room. Retrieved 2018-05-05. ^ a b c d "Museum of Natural History Reveals Design for Expansion". The New York Times. 2015-11-05. Retrieved 2018-05-05. ^ Pogrebin, Robin (2014-12-11). "American Museum of Natural History Plans an Addition". The New York Times. Retrieved 2018-05-05. ^ a b Wachs, Audrey (2016-10-11). "Landmarks Commission approves Natural History Museum expansion". Archpaper.com. Retrieved 2018-05-05. ^ "Natural History Museum files plans for Gilder Center expansion". Real Estate Weekly. 2017-08-14. Retrieved 2018-05-05. 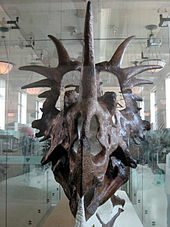 Wikimedia Commons has media related to American Museum of Natural History.